ABBA walikuja kuwa maarufu sana baada ya kushinda mwaka 1974 katika mashindano ya kutafuta nyimbo bora za nchi za Ulaya (Eurovision Song Contest). Walikuwa na vibao vingi tu malidhawa. Vibao kama vile "Dancing Queen", "SOS", "Mamma Mia", na "Waterloo". Karibuni nyimbo zao zote zilikuwa zikitungwa na Ulvaeus na Andersson. Kundi lilikuwa kuvunjika mnamo mwaka wa 1982, lakini bado vibao viliendelea kuwa maarufu. Nyimbo moja ya ABBA ilibahatika kuonekana katika baadhi ya filamu (ikiwemo filamu ya Kiaustralia-The Adventures of Priscilla, Queen of the Desert na Muriel's Wedding. 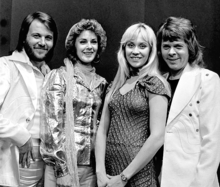 ABBA - The Site - Official site. This site is owned and maintained by Universal Music AB in Sweden. "People Need Love" • "He Is Your Brother" • "Ring Ring" • "Love Isn't Easy (But It Sure Is Hard Enough)" • "Waterloo" • "Honey, Honey" • "Hasta Mañana" • "So Long" • "I Do, I Do, I Do, I Do, I Do" • "SOS" • "Mamma Mia" • "Fernando" • "Dancing Queen" • "Money, Money, Money" • "Knowing Me, Knowing You" • "The Name of the Game" • "Take a Chance on Me" • "Eagle" • "Summer Night City" • "Chiquitita" • "Does Your Mother Know" • "Voulez-Vous" • "Angeleyes" • "Gimme! Gimme! Gimme! (A Man After Midnight)" • "I Have a Dream" • "The Winner Takes It All" • "On and On and On" • "Super Trouper" • "Lay All Your Love on Me" • "One of Us" • "When All is Said and Done" • "Head Over Heels" • "The Visitors" • "The Day Before You Came" • "Under Attack" • "Thank You for the Music"
"She's My Kind of Girl" • "En Karusell" • "Another Town, Another Train" • "Nina, Pretty Ballerina" • "Rock'n Roll Band" • "King Kong Song" • "Bang-A-Boomerang" • "Rock Me" • "I've Been Waiting for You" • "My Love, My Life" • "That's Me" • "Arrival" • "As Good as New" • "Happy New Year" • "Our Last Summer" • "Slipping Through My Fingers" • "Like an Angel Passing Through My Room" • "Put On Your White Sombrero"
Ukurasa huu umebadilishwa kwa mara ya mwisho tarehe 28 Julai 2015, saa 16:10.